Los Angeles Philharmonic experiments with virtual reality. A still from the VR experience that shows some of the abstract visual accents. Classical music and virtual reality are an unlikely combination. In contrast to other VR applications like video games and documentaries, a VR experience for classical music is hard to imagine. What would we even be looking at? But a new program from the Los Angeles Philharmonic is exploring exactly that—it seeks to use VR to reach and engage new generations of fans, starting with the well-known opening of Beethoven’s Fifth Symphony. The virtual reality component is part of a project (and excellent pun) called Van Beethoven. It’s an actual truck that is made to look and feel like a concert hall on the inside—complete with the same audience seats that are in Walt Disney Concert Hall. Van Beethoven will travel around Los Angeles, and the philharmonic hopes that tens of thousands of L.A. residents will be able to experience VR in the van at public gathering spots like schools and parks. I was interested to demo the project because I am a fairly dedicated and knowledgeable classical music fan, but I have also grappled with the question Mark Vanhoenacker bluntly asked and explored in a 2014 Slate piece: Is classical music dead? Privilege has always been so inherent to the genre (music programs get cut when school budgets are tight; instruments, lessons, and attending concerts are all fairly expensive) that it’s never seemed to me that initiatives to democratize it were really gaining traction. But I was intrigued by the idea of using VR to convey some of the subtle reasons that classical music is so special. My favorite thing about attending classical music concerts is actually observing the musicians with a small pair of binoculars as they play. If that sounds creepy to you, let’s just push past it, because I do it out of sheer amazement that physicality and artristry can blend through an intstrument into a collaborative and virtuosic medium. The L.A. Phil’s VR program gets me even closer than my binoculars can. I can be right next to the musicians, or look at them from angles that would never be possible in real life. I can also face the conductor, in this case L.A. Phil music and artistic director Gustavo Dudamel, as he conducts—something that is almost never possible in a live concert. If you know a little bit about how playing instruments and conducting works, this is all fascinating. It’s a big if, though. I would think that for most people, getting up close and personal with musicians as they play isn’t going to make classical music more accessible by itself. You still don’t know the difference between an oboe and a clarinet. In the L.A. Phil’s VR program, you also don’t have complete free will to roam around. I think one of the most exciting parts of attending live classical music is watching percussionists at work. During Beethoven’s Fifth there are some fun timpani lines, and the VR demo showed a great angle for watching the timpanist, but didn’t necessarily offer it to me during the optimal moments. There are a bunch of nice aspects of the program. Depending on “where you are,” the balance of sound changes, like it would in real life, so you hear more viola if you’re near the violas, more flute if you’re by the woodwinds, etc. The L.A. Phil also added abstract visualizations of the music to give viewers something else to look at while they listen. For me these elements were distracting, but I can see how they might add engagement for someone who is new to watching “live” classical music. My biggest question after viewing the demo has to do with length. There’s a big difference between enjoying a few minutes of a well-known symphony and being motivated to watch/listen to the whole thing. And then there’s an even bigger difference between that and wanting to attend a performance of an even longer piece that you’ve never heard of. As orchestras around the country attempt to put together compelling programs for new audience-members, they often rely on recognizable and relatively short pieces to keep concerts moving. But this is only the first step in exposing people to the true joy of classical music. 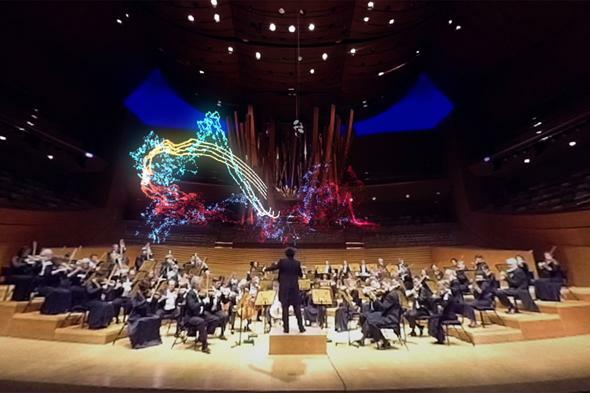 L.A. Phil has created an app so anyone can access the VR experience. If it posts two-hour–long Mahler symphonies, I will watch them and spend the whole time basking in the surround sound, checking out where the French horn players are holding their bells, and scrutinizing the cymbal hits. But I don’t know if anyone else will want to sit on a bus for that long strapped to a VR headset and wondering what their friends are posting on Instagram.